Are you going to make a new blog or website? then you must know that Hosting is the very primary thing that comes first when you create a new website or you can say it plays very important role on your website work. 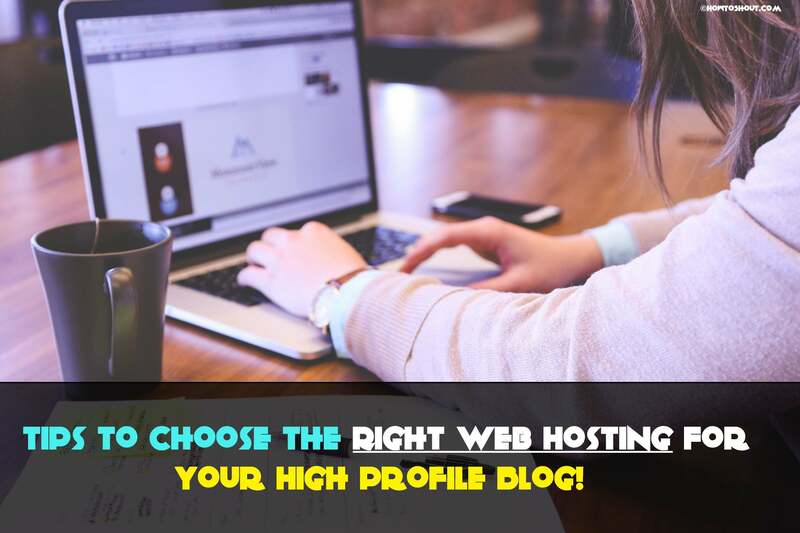 So if you want to know more about how to pick the right and best web host for your new high profile blog, then you must pay attention to this post because today we’re gonna share some tips which help you to select the right web hosting services for your upcoming high profile blog. Here I said High Profile blog” a blog that receives very massive traffic and receives a high amount of visitors per day. Now think If you have 1 lac visitors per day on your blog and suddenly your blog goes down 🙁 and your visitors are facing issues to accessing your blog, so what you’re gonna do? You can contact your web hosting company but probably they take so much time to fix the issue or they have not 24/7 support and your visitor get back and open another website and this is how every blogger or webmaster lose their traffic as well as the audience. Hence I came to help you in selecting a new web host for your blog and then you’ll no longer facing down or any attack issue on your blog or site. Picking a web hosting company provider for your high profile blog is an essential step in achieving its success. You could be creating interesting, informative and relevant blog posts but if you don’t find the right hosting service, you might end up with no readers at all, which will beat the purpose of starting the blog in the first place. You can learn more about web hosting at this page. 1 Below are some tips that will help you discover the right web hosting provider. Below are some tips that will help you discover the right web hosting provider. You need to make sure that the web hosting service provider offers complete server uptime warranty. This is important at any stage of your business because you don’t want to compromise the quality and trust that you have built with your readers. Remember that web hosting companies which do not provide you with the assurance that your website will be up and running 99.9% of the time, are probably not a good fit for you. If they can’t give you this guarantee, then there’s a big possibility that your website may be down a lot of the time, which will make people frustrated every time they visit it. With the numerous numbers of websites online, it takes a few minutes for someone to decide whether they want to stay on a site or move on to the next one. That is why it is important to make the user experience as seamless as possible, once your website visitors land on your site. The very best website hosting providers give unlimited bandwidth. This will help save you from stress, especially when you start getting a huge number of visitors and pageviews on your site. If you decide to have large files on your site, you will require unlimited bandwidth. Aside from that, your guests are going to have the luxury of launching as many web pages as they desire. If your website offers free downloads for your customers, then the large bandwidth could be very advantageous as you don’t need to pay extra charges. If you want to increase your search engine rankings, you should create more content on your blog. You need to find a web hosting company which will provide enough storage for your content. Your pages need to load fast if you do decide to have a lot of material on the site. Talk to your web hosting provider about your blog requirements. This way, you can settle on a web hosting company listens to you and provides what your website requires. Your readers will, consequently, be satisfied when they visit and read your blog. Among the worst things which can happen to you is not having the ability to get in touch with a customer support, in case you have any issues with your site. The very best web hosting providers are those that have live chat service accessible 24 hours each day, seven days a week. This will give you immediate aid and support when difficulties arise, by simply talking to a customer service representative. The last thing to consider when you select the web host for your high profile blog is Quality of the hosting that your blog will run on. All provider pretend you that they will provide excellent services, but this is ain’t the truth 😛 I don’t know much about which hosting company provides you excellent service but I can tell you that choose the only hosting provider that has an SSD, latest OS on their servers ( if you choose Linux hosting and Ubuntu OS then make sure the version of the Ubuntu is latest) and also ensure that the MySQL latest version PHP version should be latest (Current Stable PHP 7.1.11) and if you’re not the tech savvy then I would like to recommend you to go with cPanel hosting in this case you don’t need to work with Linux Terminal and its commands, you’ll get a user-friendly control panel to manage your host. So guys hope you now understood how you need to select the web hosting service for your high profile blog, open that Reddit page to know more knowledge regarding this and that’s it. That’s everything you need to know before buying a web host for your site and if you like this post then do share this post with others and let them know how to choose the right hosting provider. If any question is running in your mind then do comments below without any hassle and we’ll try to answer your question as soon as possible. Have a nice day! Thank you for giving such a tutorial. And this tutorial clear all the doubt about the hosting so thanks.